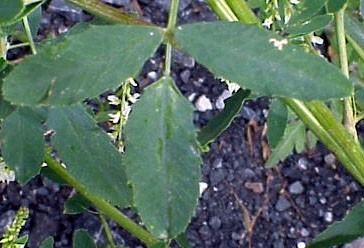 Biennial legume with compound leaves consisting of 3-leaflets (trifoliolate). Found throughout the Southern states in fields, roadsides, and waste places. Trifoliolate leaflets oblong or oblanceolate, 1-2.5 cm long, 8-12 mm wide. Leaflets without hair above and having appressed hairs below. Leaflet margins serrated halfway or more back from the apex. Short-pubescent above, without hairs below. 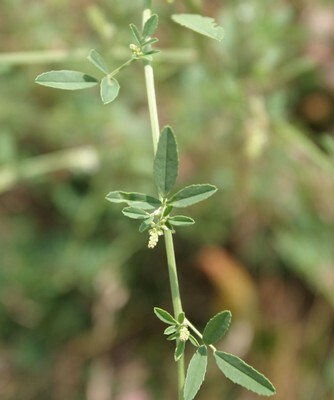 Legume, dark brown to black at maturity, ovoid, 2.5-4 mm long, without hairs, and cross-ribbed. Small, white, arranged in many-flowered terminal and axillary racemes. Trifoliate leaves with serrated margins halfway or often more back from the apex. 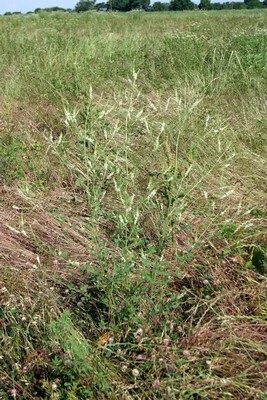 White sweet clover is similar in appearance to yellow sweet clover, but has white flowers and net-veined pods.